Many things are Buy It Now’s, where the dealer sets the price. They have the time, so it’s up to the buyer to either pay or negotiate. But here are some beautiful pieces on the market. 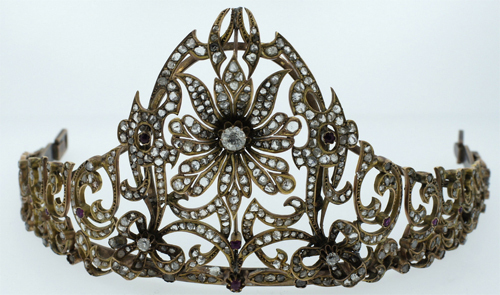 This Victorian tiara, c. 1860, is selling for $17,500. Diamonds and rubies, set in yellow 14K gold, highlight a single-flower medallion. 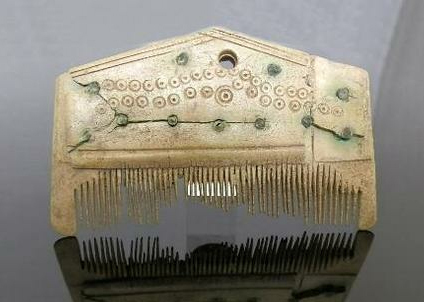 The dealer dates this Byzantine bone comb to 997 AD. 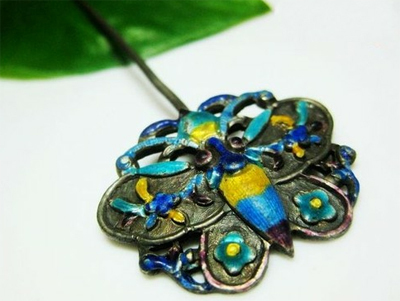 It is original, decorated with linear ring and dot patterns, and held together by copper rivets. In 997 AD, Emperor Basil II won the Battle of Spercheios, on the shores of the Spercheios River in what is now central Greece. 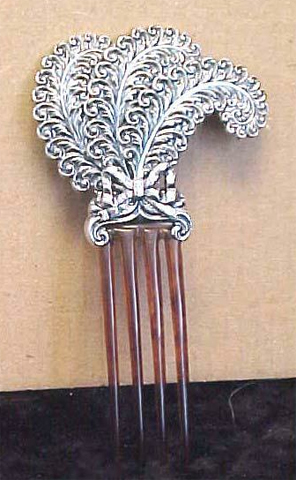 Can we imagine that this comb could have been used by an officer in that battle? Price: $600. 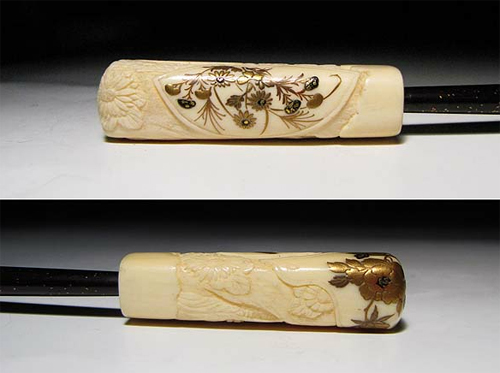 The price of this Japanese Meiji set is ridiculous at $2000, but it has everything: ivory, perfect condition, signed, imaginative… Fan medallions with gold maki-e paint show tree branches, flower beds, and a wheelbarrow in between carved flowers. The kogai stick matches superbly. It’s a Maltese Falcon. Usually, I do not show silver-topped pieces over celluloid teeth, but I liked this one because it had an aigrette theme. Could be French instead of Birmingham Sterling. No markings were shown. The dealer wants $295 for it. Dreaming is nice. This French Empire coral diadem has all its pieces in place. 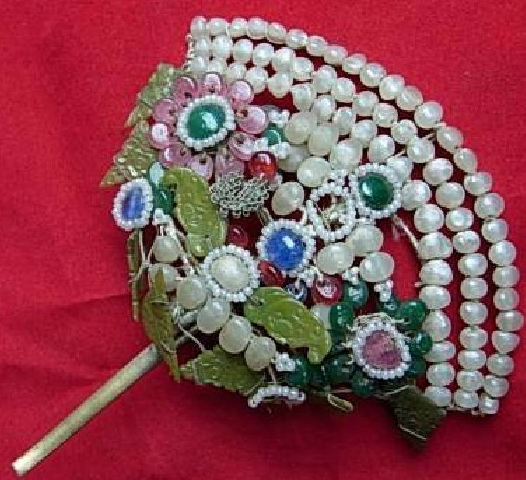 No brass comb, but coral was Empress Josephine’s favorite decoration. It’s an auction with one day to go. Starting price: $565. Given what French Empire pieces have been selling for, the dealer might sell this on a snipe bid. 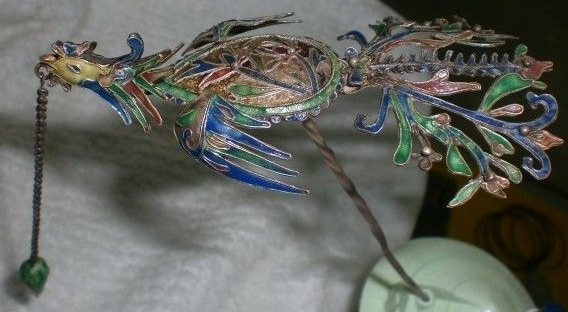 This dealer has some breathtaking Chinese hairpins from the 1800s. 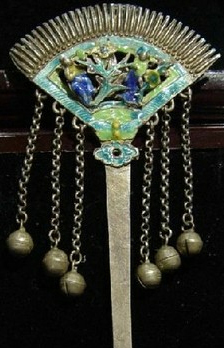 Most are silver with enamel. One has kingfisher feathers, and another is made of glass beads. Prices: $148, $500, $330, $290, $290 again, and $268 respectively. 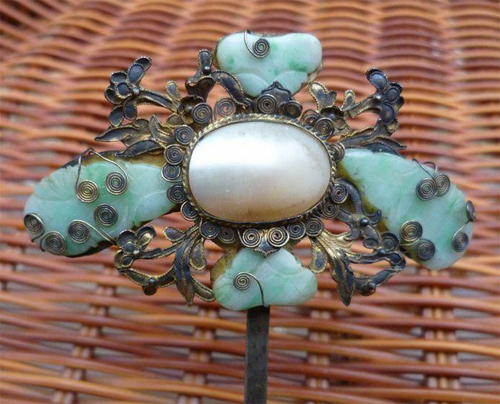 One thing I love about the jade and pearl piece is the scrolled wire handles holding the stones. Alexander Calder used the same idea in his hair combs, albeit as a major sculptural feature rather than an engineering solution.